For a content distributor, determining what titles to license for their markets is only the first step. Once a suitable international title has been selected and the distribution deal is signed, the next challenge is how to localize this content for a new market. Obviously, for territories that do not share a language, the content must be made “fit for consumption”, with subtitling and dubbing being the two main ways of achieving this. Both methods have their advantages and disadvantages and further to this, individual markets have their own norms of how content is usually localized. In this analysis, we will be focusing on subtitle localization specifically. The reason for this is that as content becomes more and more aimed at global audiences from the start, increasing numbers of high-profile productions are including subtitled content in their shows. Perhaps the most prominent example of this trend is the Netflix crime drama Narcos. This show is an American production but includes many scenes that are entirely in Spanish with English subtitles. Although the United States does have a high proportion of Spanish-speakers, Narcos is also a top-ranked show in markets like France, Italy and Poland that relatively speaking do not have large Spanish-speaking populations. 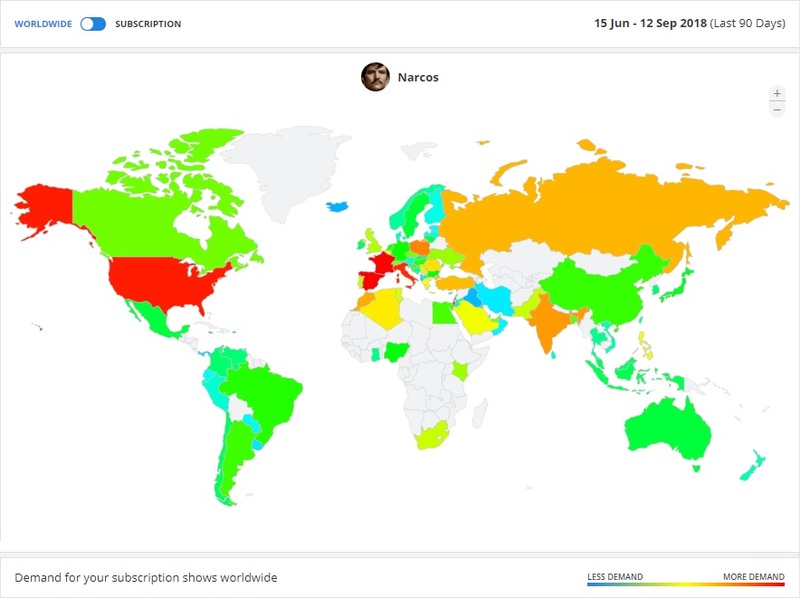 To discover how common it is for content with subtitles to be consumed by global audiences, Parrot Analytics commissioned a survey in the USA, Germany, South Korea and Mexico, asking the following question: “In the last month, have you watched a non-English / German / Korean / Spanish* language TV series with subtitles?” (*as appropriate to the country surveyed). The survey involved participation from 500 respondents per country, for a total of 2,000 respondents. Of the markets surveyed, Mexican audiences led the way at engaging with subtitled shows. 44% of Mexicans surveyed reported that in the past month they had watched a foreign-language title with subtitles. 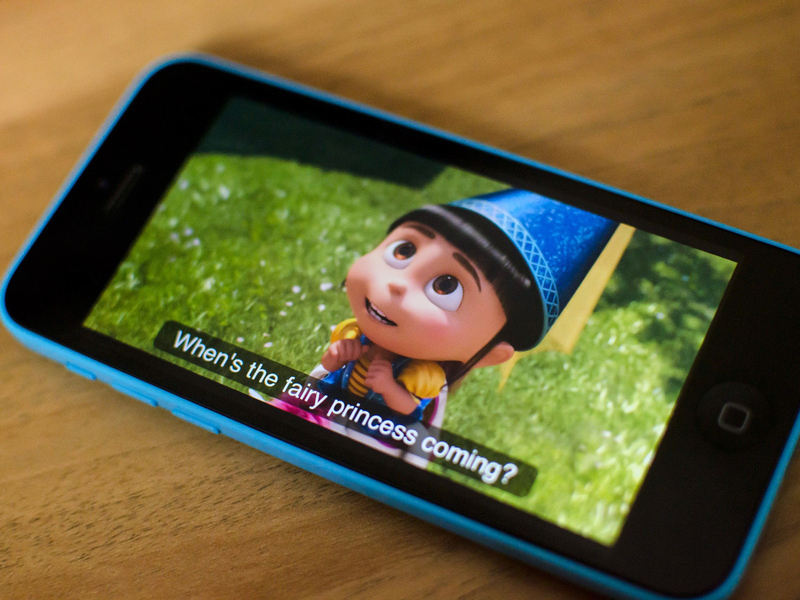 This finding reflects the fact that subtitling international content is a common localization practice in Mexico. Similar to our findings in Mexico is South Korea, where 36% of respondents said that they had watched a non-Korean title with subtitles in the past month. Non-Korean TV content is typically subtitled officially and in addition to official methods, there is a strong “torrenting scene” in the country that primarily engages with foreign content in subtitled form. Piracy of this form is more common amongst younger people, which aligns with our observations in the next section that younger Koreans are more likely to have watched subtitled content. 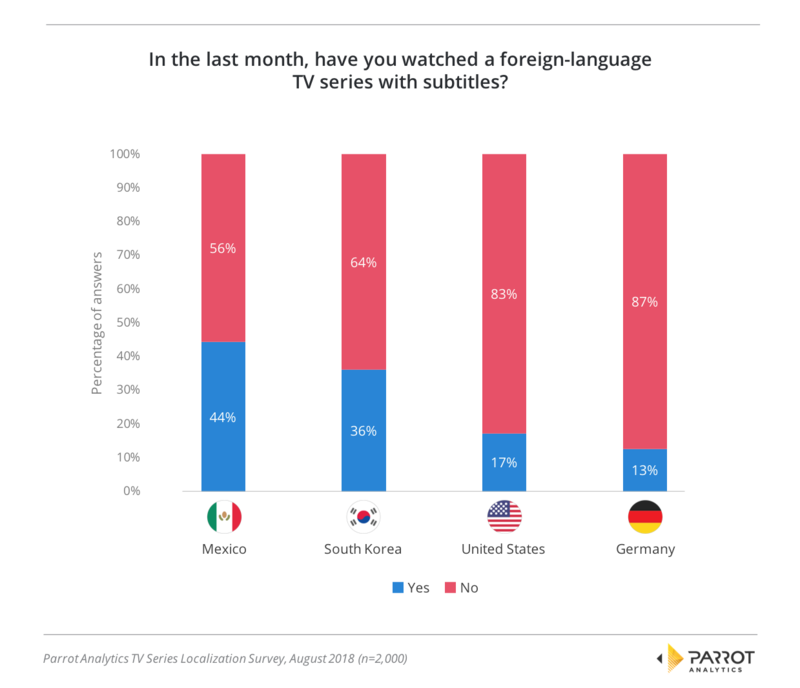 In the United States and Germany, audiences are less willing to engage with subtitled foreign-language content, with only 17% of respondents in the U.S. and 13% of respondents in Germany answering that they had watched a foreign-language show with subtitles in the past month. Of course, this does not necessarily mean that the U.S. and German markets are resistant to international content, it simply indicates that using international content with subtitles may not be the best way to introduce such titles to these markets. Subtitled content is not the type of localization that audiences in these markets expect and it appears in general that dubbing is a better choice for these two markets. Finally, we looked at how the percentage of responses changed depending on the age of the survey participants. We discovered that in South Korea, the United States and Germany, the age demographic with the highest rate of consuming subtitled content is the youngest age group. For example, Koreans aged 18 to 24 years were 5% more likely to have watched subtitled content than the Korean average. For the United States, those aged 18-24 were 12% more likely to watch subtitled content than the market average, and for Germany, this same age group is 11% more likely to watch foreign subtitled content compared to the German market average. One potential reason for the increase in viewing of subtitled international content among this age group is the popularity of Japanese anime, which is commonly watched subtitled by fans of the genre. As previously mentioned, another potential reason is that the piracy of TV shows is more common among young people, where pirated material is more likely to be subtitled than dubbed. 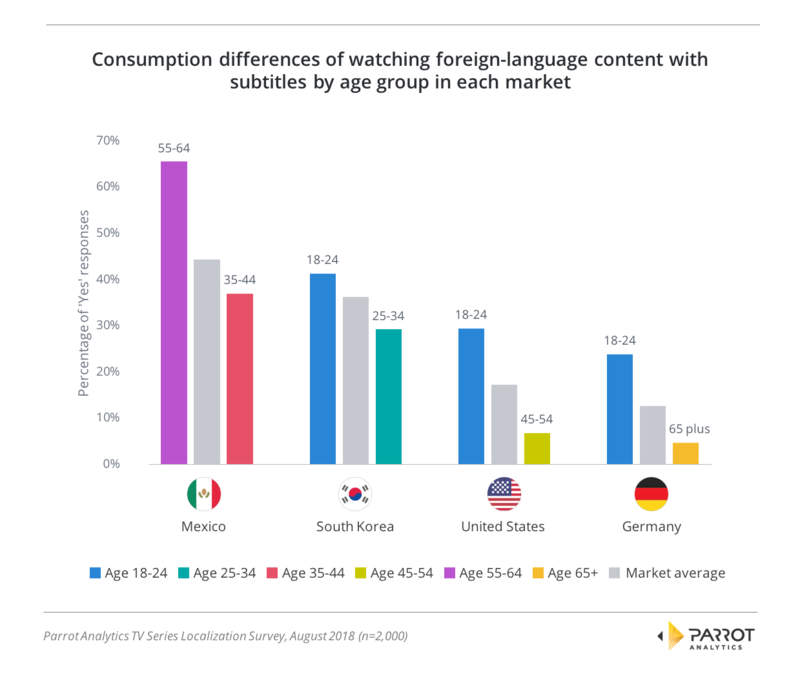 Mexico’s localization preferences stood out against the other three markets examined where the 55-64 age group was the group most likely to answer that they had consumed subtitled content recently. At the other end of the scale, the age group least likely to have watched a subtitled show in the past month skewed older in the United States and in Germany. The age group that watched subtitled shows least in Germany was the 65+ cohort, while in the U.S. it was those aged between 45-54. This trend was less pronounced in Mexico, where the least likely age demographic to say they watched subtitled shows was the middle-aged 35-44 group. The finding was very different again in South Korea, where the age group that said they interacted least with subtitled non-Korean titles is the 25-34 age demographic, the next age group up from the 18-24 cohort that is most likely to watch subtitled content. In each country, we further segmented responses based on gender. We discovered that generally, women are more likely to watch shows with subtitles than men. In South Korea, women answered that they had watched a subtitled non-Korean language title in the past month 9.4% more than men in the same country did. We discovered the same result in the USA, where women are more likely than men to watch a subtitled show by 7.1% and in Mexico this figure is 6.5%. A simple explanation of this trend is that when shows from subgenres preferred by women are localized to these countries they are more likely to be subtitled than dubbed. The general finding that women watch more foreign-language content with subtitles than men does not hold true in Germany. In this market, we found that German men were approximately 1% more likely to watch a subtitled foreign language show than women. However, with less than one percent difference, this is much less dramatic than the trend towards women engaging with subtitled content in the other three markets. These results show how important it is to know not only the general attitude towards localization methods for a specific market but also the importance your specific target demographic places on localization: If you were deciding the Korean localization of a title that appeals mostly to 18 to 24 year-old women, then subtitles are a reasonable choice. However, if you are trying to localize a title for 55 to 64 year-old American men, then subtitles are a poor choice. For more information, reach out to Parrot Analytics for a live demonstration of our Demand Portal, or watch our latest product video.